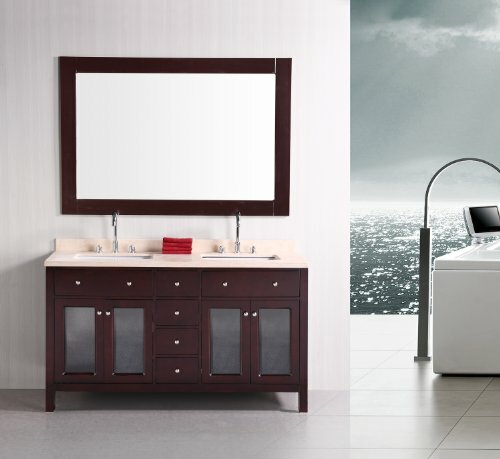 The 60" Cosmo bathroom vanity is a sleek and unique double-sink addition to any bathroom. The vertical pattern created by the long cabinet doors, the striking meld of matte and glossy blacks, and the contrast created by satin nickel hardware and the white porcelain under-mount sinks all work together to create a vanity with futuristic panache and a richness in shapes, textures, and contrast. The solid wood frame, solid hardwood panels with water-resisting treatments, and granite countertop back up the strength of the visual design with physical robustness and longevity. Hidden pullout drawers inside of the two soft-closing double-door cabinets provide flexible storage options for this full-sized vanity. 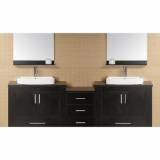 The Moscony 60" Double Sink Vanity Cabinet is constructed of solid wood and provides a contemporary design perfect for any bathroom remodel. 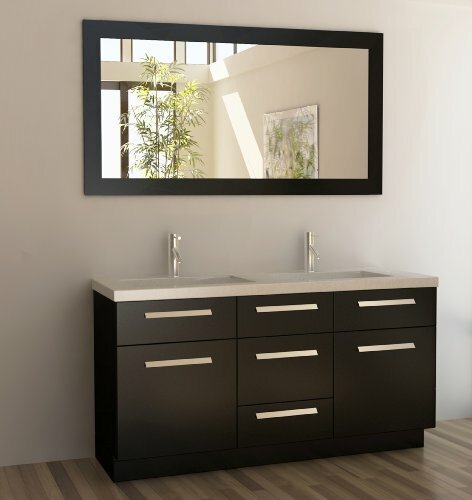 The storage in this free-standing vanity set includes one fully functional drawer and three single door cabinets with three strictly decorate drawer panels lining the top of the cabinet each accented with brushed nickel hardware. The cabinet is available in both espresso and in white and comes as a complete set with a white quartz counter top and matching framed mirror. The Design House 541680 Vanity Combo Espresso Vanity Cabinet features an elegant espresso finish, brushed nickel hardware and a white marble belly bowl top. 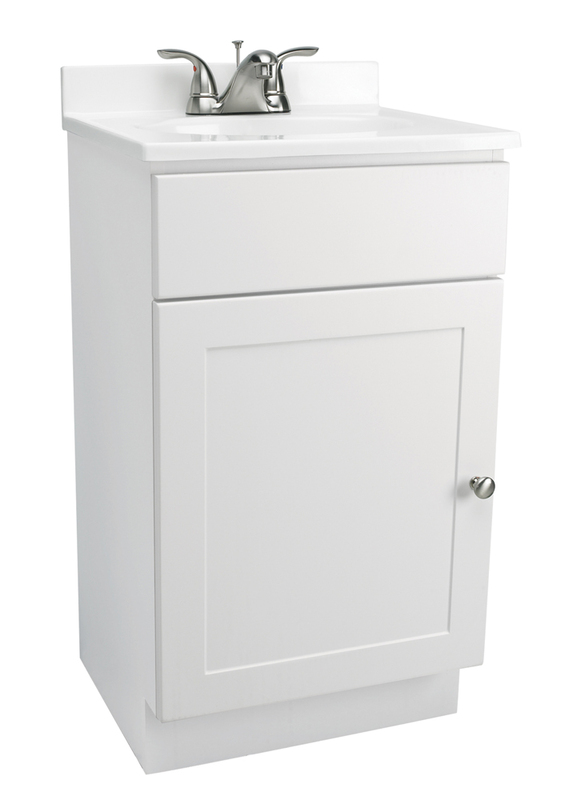 This product meshes modern aesthetics with European sensibilities and has a 12-inch cabinet depth. This item measures 24-Inch by 12-Inch by 31.5-Inch and adds a modern feel to your home decor. This product is perfect for remodeling your bathroom and matches painted cabinets and granite counter tops. The preassembled design is California 93120 compliant. This vanity will not chip or stain in steamy bathrooms. The cabinet doors glide open revealing a spacious compartment sturdy enough to hold shampoo, medicine and makeup. 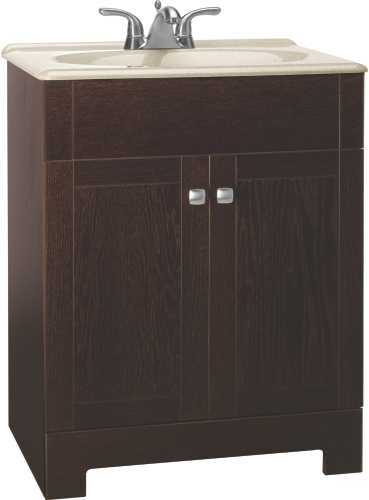 The Design House 541680 Vanity Combo Espresso Vanity Cabinet has a 1-year limited warranty that protects against defects in materials and workmanship. Design House offers products in multiple home decor categories including lighting, ceiling fans, hardware and plumbing products. With years of hands-on experience, Design House understands every aspect of the home decor industry, and devotes itself to providing quality products across the home decor spectrum. Providing value to their customers, Design House uses industry leading merchandising solutions and innovative programs. Design House is committed to providing high quality products for your home improvement projects. The Design House Vanity Cabinet Combo features a white finish, brushed nickel hardware and is perfect for a relaxed country motif. Clean lines, concealed hinges and particle board side panels give this cabinet a sleek finish. The door is made of MDF material and has an indented panel for a stylish look. This product measures 24-Inch by 18-Inch by 31.5-Inch and fits in smaller bathrooms. This product comes fully assembled and is perfect for remodeling your bathroom. Coordinate your home with the rest of the Design House collection of various fixtures and furnishings. 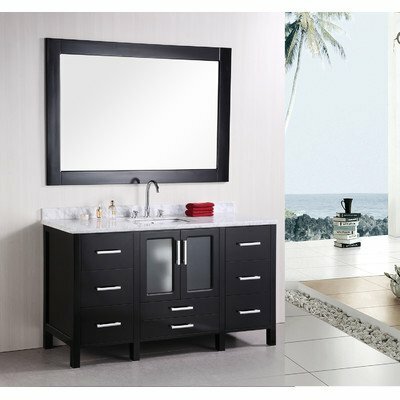 The Design House Vanity Combo comes with a 1-year limited warranty that protects against defects in materials and workmanship. Design House offers products in multiple home decor categories including lighting, ceiling fans, hardware and plumbing products. With years of hands-on experience, Design House understands every aspect of the home decor industry, and devotes itself to providing quality products across the home decor spectrum. Providing value to their customers, Design House uses industry leading merchandising solutions and innovative programs. Design House is committed to providing high quality products for your home improvement projects. 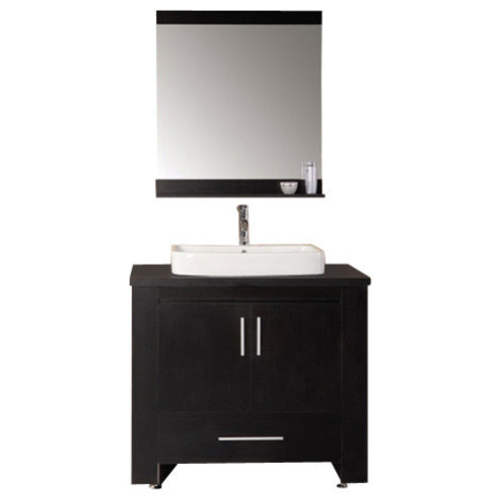 The Design House fully assembled vanity cabinet combo features a modern stylish design that goes with any dTcor. The cabinet features a white finish and satin nickel hardware. The solid white cultured marble vanity top is included, with 4-inch centerset mount holes pre-drilled. This 30-inch wide by 18-inch deep countertop+s squared edges add a sleek finish to appeal to contemporary or modern tastes. 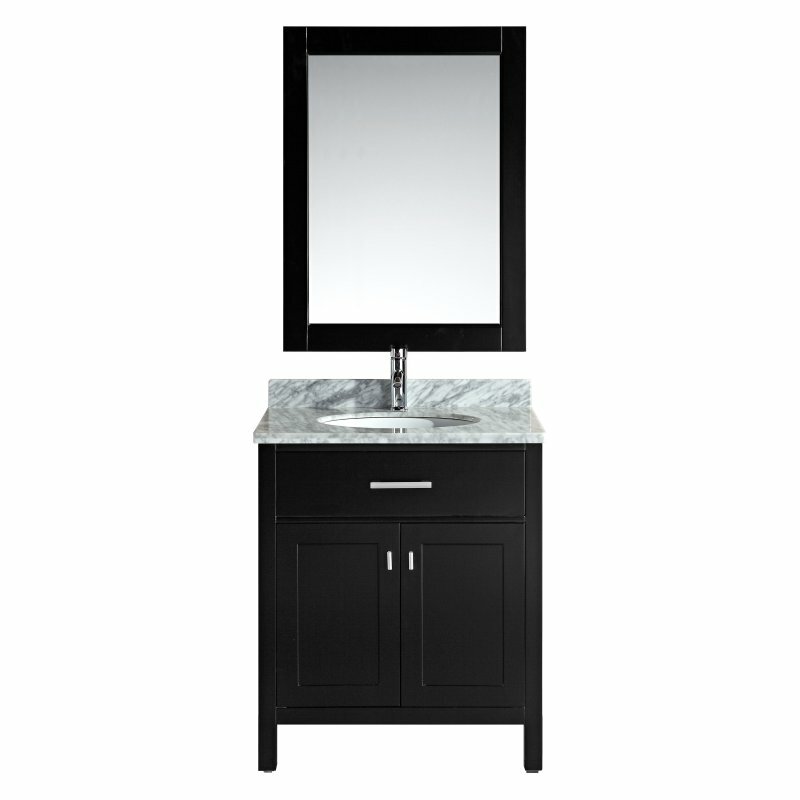 This vanity cabinet with cultured marble vanity top comes with a 1-year limited warranty that protects against defects in materials and workmanship. Design House offers products in multiple home decor categories including lighting, ceiling fans, hardware and plumbing products. With years of hands-on experience, Design House understands every aspect of the home decor industry, and devotes itself to providing quality products across the home decor spectrum. Providing value to their customers, Design House uses industry leading merchandising solutions and innovative programs. Design House is committed to providing high quality products for your home improvement projects. 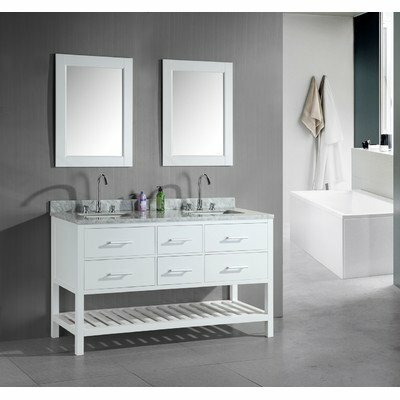 The Design House 541656 Vanity Combo White Vanity Cabinet features a white finish, brushed nickel hardware and white marble belly bowl top. Clean lines, concealed hinges and particle board side panels give this cabinet a sleek finish. The doors are made of MDF material and have indented panel for a stylish look. This product measures 24-Inch by 12-Inch by 31.5-Inch and fits in smaller bathrooms. Coordinate your home with the rest of the Design House collection of various fixtures and furnishings. 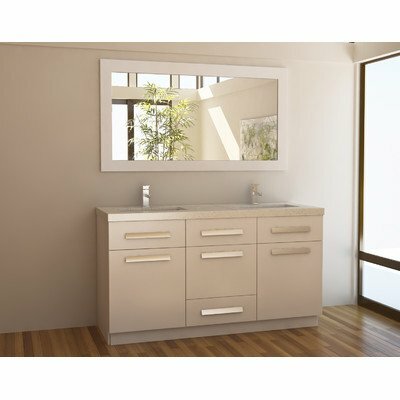 The Design House 541656 Vanity Combo White Vanity Cabinet comes with a 1-year limited warranty that protects against defects in materials and workmanship. Design House offers products in multiple home decor categories including lighting, ceiling fans, hardware and plumbing products. With years of hands-on experience, Design House understands every aspect of the home decor industry, and devotes itself to providing quality products across the home decor spectrum. Providing value to their customers, Design House uses industry leading merchandising solutions and innovative programs. Design House is committed to providing high quality products for your home improvement projects. RSI HOME PRODUCTS SEDONA COMBO BATHROOM VANITY CABINET WITH BEIGE SST TOP, FULLY ASSEMBLED, JAVA, 24" RSI HOME PRODUCTS SEDONA COMBO BATHROOM VANITY CABINET WITH BEIGE SST TOP, FULLY ASSEMBLED, JAVA, 24"
The Design House 541664 Vanity Combo White Vanity Cabinet features a white finish, brushed nickel hardware and white marble belly bowl top. Clean lines, concealed hinges and particle board side panels give this cabinet a sleek finish. The doors are made of MDF material and have indented panel for a stylish look. This product measures 30-Inch by 12-Inch by 31.5-Inch and fits in smaller bathrooms. Coordinate your home with the rest of the Design House collection of various fixtures and furnishings. 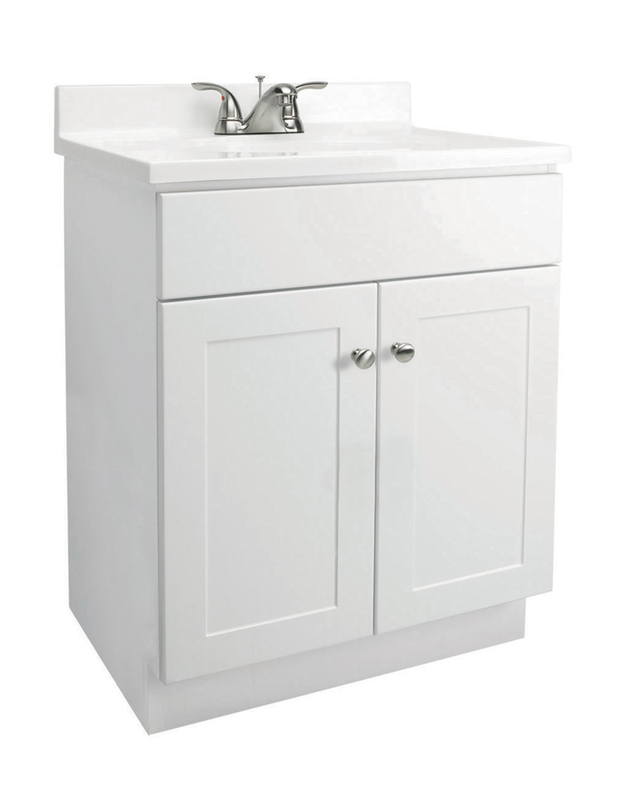 The Design House 541664 Vanity Combo White Vanity Cabinet comes with a 1-year limited warranty that protects against defects in materials and workmanship. Design House offers products in multiple home decor categories including lighting, ceiling fans, hardware and plumbing products. With years of hands-on experience, Design House understands every aspect of the home decor industry, and devotes itself to providing quality products across the home decor spectrum. Providing value to their customers, Design House uses industry leading merchandising solutions and innovative programs. Design House is committed to providing high quality products for your home improvement projects. The Design House 541599 Vanity Combo White Vanity Cabinet features a white finish, brushed nickel hardware and is perfect for a relaxed country motif. Clean lines, concealed hinges and particle board side panels give this cabinet a sleek finish. The door is made of MDF material and has an indented panel for a stylish look. This product measures 18-Inch by 16-Inch by 31.5-Inch and fits in smaller bathrooms. This product comes fully assembled and is perfect for remodeling your bathroom. Coordinate your home with the rest of the Design House collection of various fixtures and furnishings. 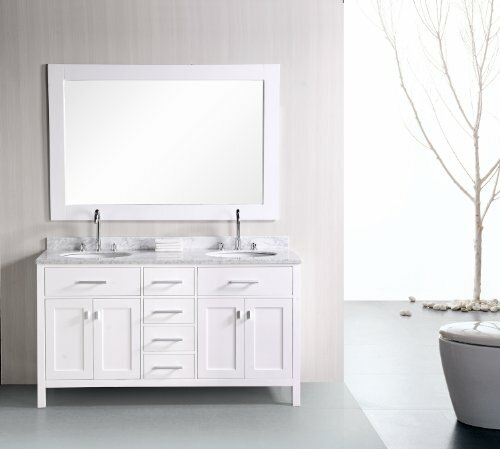 The Design House 541599 Vanity Combo White Vanity Cabinet comes with a 1-year limited warranty that protects against defects in materials and workmanship. Design House offers products in multiple home decor categories including lighting, ceiling fans, hardware and plumbing products. With years of hands-on experience, Design House understands every aspect of the home decor industry, and devotes itself to providing quality products across the home decor spectrum. Providing value to their customers, Design House uses industry leading merchandising solutions and innovative programs. Design House is committed to providing high quality products for your home improvement projects. 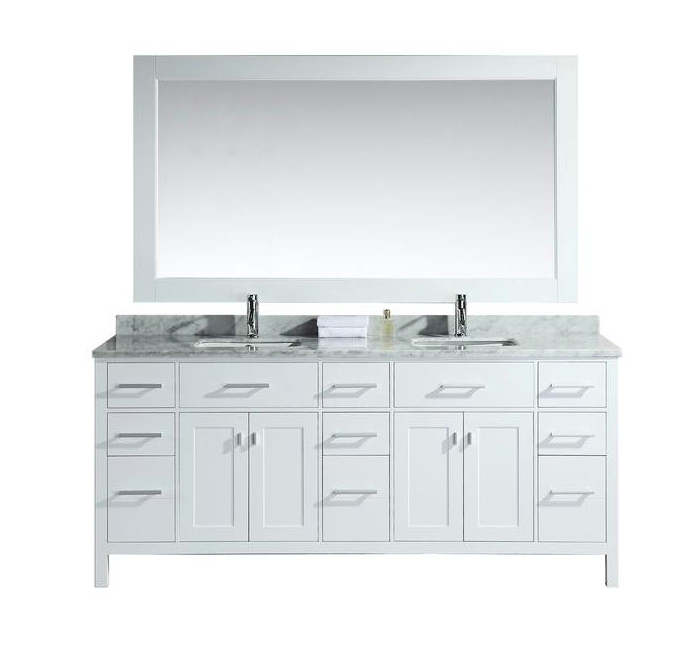 The 60" Stanton vanity features a Carrera white marble countertop, and is fully constructed of solid hardwood for maximum rigidity and longevity. The clean lines bring a crisp and contemporary look to any bathroom, while the marble countertop gives it a timeless flair. The white Carrera marble countertop, rectangular under-mount sink, and satin nickel-finish hardware creates a striking contrast against the rich espresso cabinetry. For storage, this vanity features seven drawers and a soft-closing double-door cabinet. Included is a large espresso framed mirror. 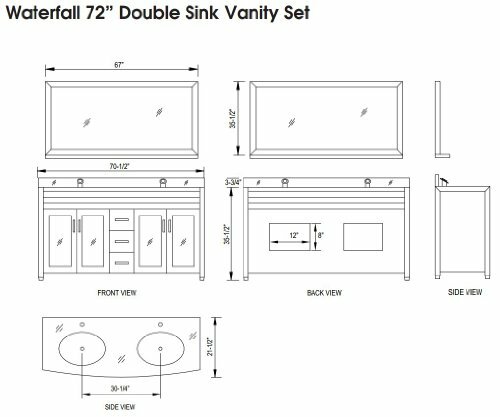 The 72" Waterfall vanity is elegantly constructed of solidhardwood in White finish, which beautifully showcases the natural aqua of the glass countertop. The integrated tempered glass counter top and sleek drop-in sink design bring contemporary elegance to any bathroom. This stylish design includes two double-door cabinets and three pullout drawers, all adorned with satin nickel hardware. Included is a large framed mirror with shelf. The Waterfall Collection is a centerpiece designed to awe and inspire the eye without sacrificing functionality, durability, or quality. Open storage, cabinet space, and large drawers - the versatile 60" New York vanity set has it all. With straight lines, porcelain drop-in sinks, and high visual contrast, the New York will stand out in any modern bathroom setting. 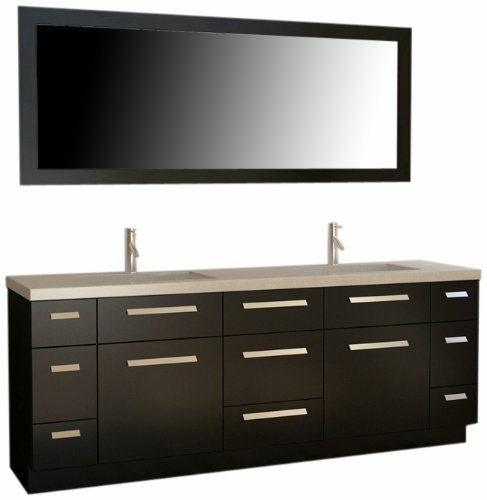 This vanity set includes a solid hardwood cabinet in espresso, two porcelain sinks with chrome pop-up drains, and two matching mirrors. 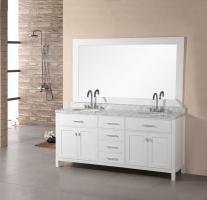 This 72" double-sink version of the Stanton vanity features solid-wood cabinets and drawers, an acrylic countertop with integrated sinks, and chrome pop-up drains. Its handsome and understated look will complement any modern bathroom, while the quality of its materials will ensure that its beauty won't fade over time. Moreover, with a generous eleven drawers and two double-door cabinets, this Stanton is also at the highest standard of utility in its class. 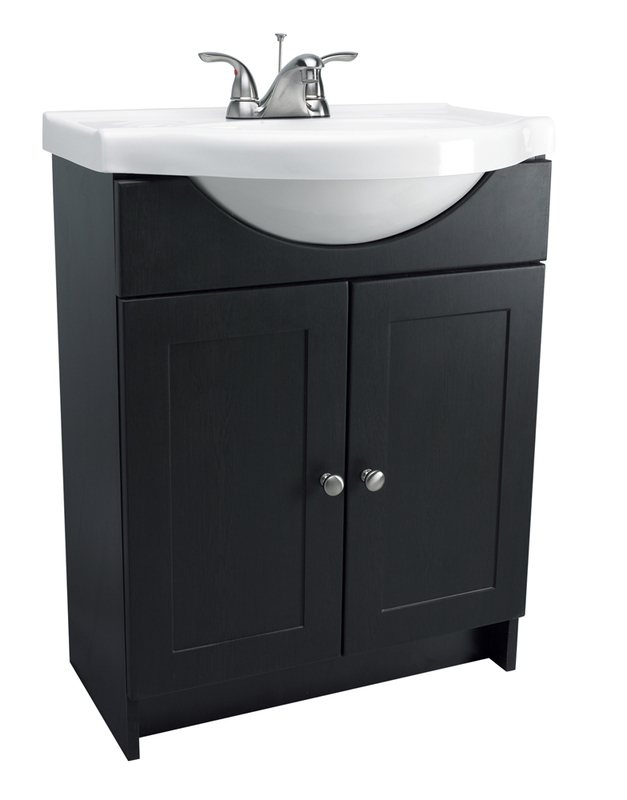 The 60" double-sink Hudson vanity is elegantly constructed of solid hardwood. Theclassic beauty of the Badal Gray marble countertop, combined with the transitional style of the espresso cabinetry, brings a sophisticated look to any bathroom. 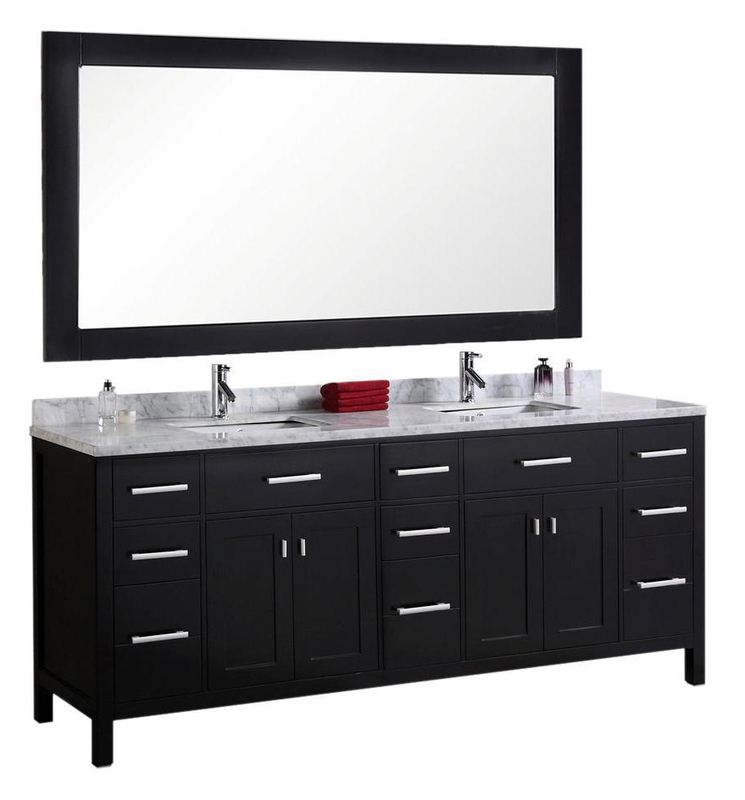 This vanity features three functional drawers and two double-door cabinets, all adorned with satin nickel hardware. The London 78" double-sink vanity in espresso is the largest model in our London series.This stylish vanity is sturdily built using solid hardwood for both the frame and the panels. The classic look of the white Carrera marble countertop and the contemporary style of the espresso cabinet meld to create a design that is both clean and luxurious. The generous storage capacity of this vanity includes two pull-down shelves, nine pullout drawers, and two soft-closing double-door cabinets, all accented with satin nickel hardware. A matching framed mirror and a pair of chrome pop-up drains are also included in this set. 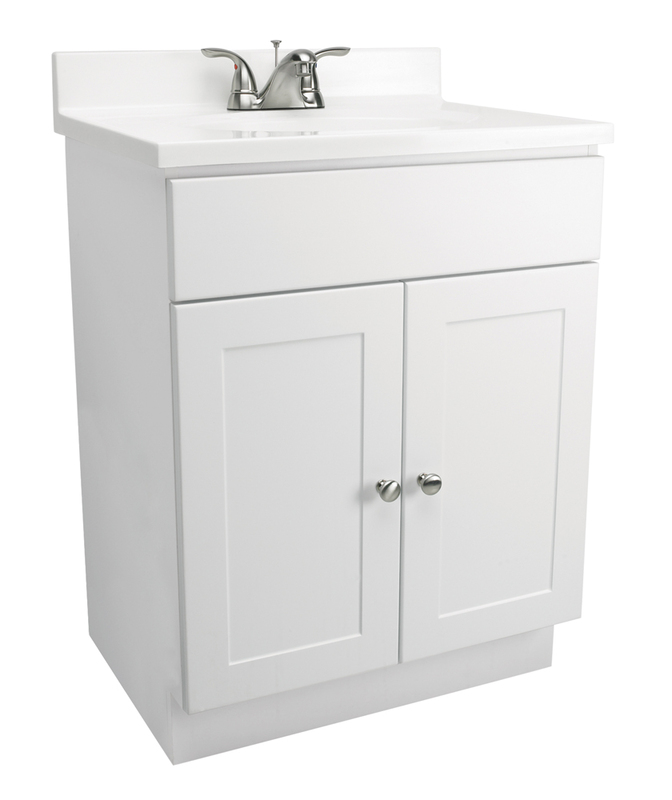 The 72" Londonrectangular-sinkdouble vanityin white is elegantly constructed of solid hardwood. The classic beauty of the white Carrera marble countertopand contemporary style of the white cabinetry bring a sophisticated and clean look to any bathroom. Seated at the base of the rectangular ceramic under-mount sinks are chrome finish pop-up drains, designed for easy one-touch draining. Two matchingframed mirrors are included. This beautiful vanity includes four pullout drawers and two pull-down shelves, all accented with satin nickel hardware.There is an additional open storage shelf at the bottom of the vanity. The London Bathroom Vanity is designed as a centerpiece to awe and inspire the eye without sacrificing quality, functionality, or durability. The Venetian 60" vanity set combines a classic feel with modern simplicity through its warm color palette, round handles, and crisp lines. The espresso cabinet features solid hardwood construction for both the frame and the panels. Seated at the base of the two under-mount ceramic sinks are chrome pop-up drains, designed for easy one-touch draining. Practicality was not sacrificed, as this vanity includes six pullout drawers and two soft-closing double-door cabinets, all accented with satin nickel hardware. 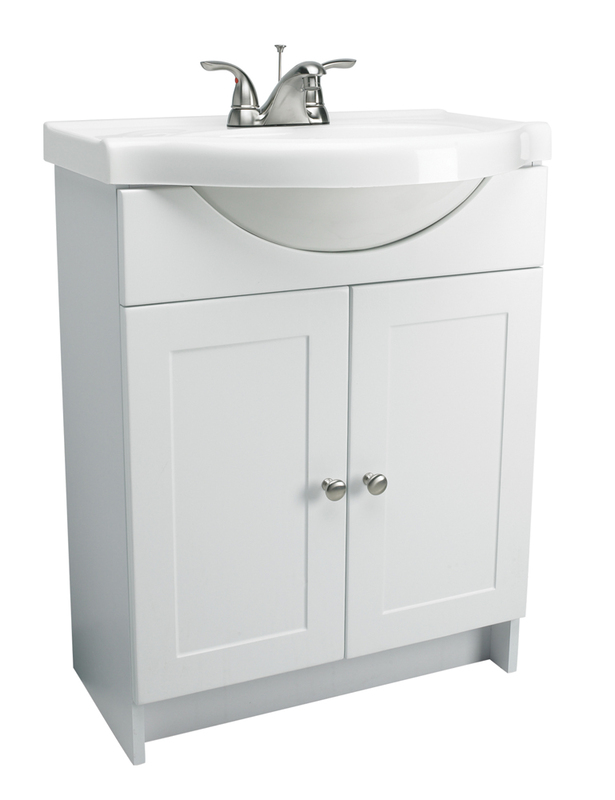 The 72" London double-sink vanity in white is elegantly constructed of solid hardwood. The classic beauty of the white Carrera marble countertop and the contemporary style of the white cabinetry bring a crisp clean look to any bathroom. Seated at the base of the two ceramic sinks are chrome finish pop-up drains, designed for easy one-touch draining. A large white frame mirror is included. This beautiful vanity has ample storage, which includes two large pull-down shelves, four pullout drawers, and two soft-closing double-door cabinets, all accented with satin nickel hardware. 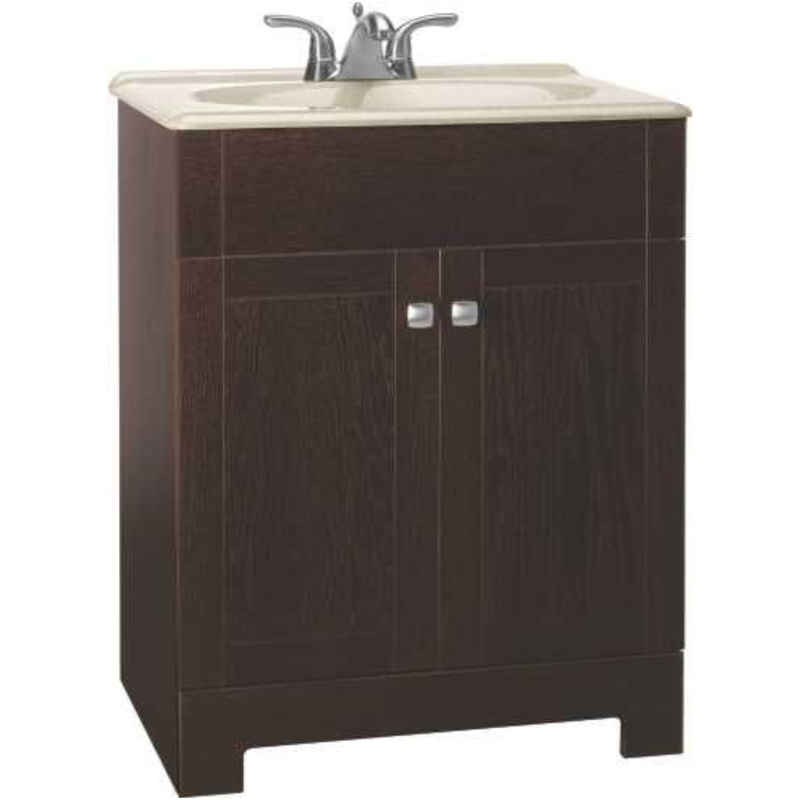 The Washington 92" double-sink vanity in espresso is stylishly constructed of solid plywood panels with veneer laminate. The stylish white rectangular sinks and sleek espresso cabinetry bring style and utility to any bathroom. This vanity includes soft-closing cabinet doors and fivepullout drawers, all adorned with satin nickel hardware. The sides of the vanity feature a removable towel bar and shelving for additional storage and utility. Twomatching mirrors with shelves are included. The Washington Bathroom Vanity is designed as centerpiece to awe and inspire the eye without sacrificing quality, functionality, or durability. 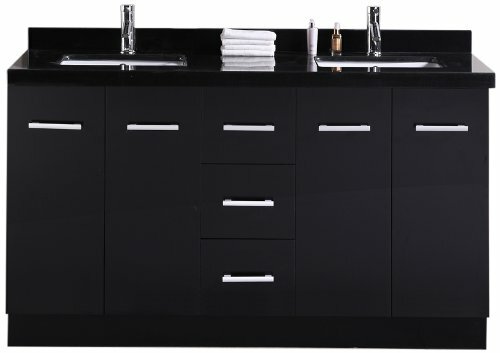 The Moscony 84" double-sink vanity is uniquely constructed of solid hardwood, simple lines, and a dark espresso finish, complemented by a beautiful quartz countertop and rectangular under-mount sinks. Being twice as hard as granite, harder than steel and titanium, and possessing a hardness just below that of gemstones, quartz is an ideal material for countertops. It's hygienic, because bacteria can't penetrate the surface, and practically maintenance-free since no sealing, polishing, or reconditioning is required. Moreover, quartz doesn't stain and is more heat-resistant than other countertop materials.This modern vanity is well equipped with sixpullout drawersand five soft-closing cabinet doors (across the middle of the vanity). A framed matching espresso mirror is also included. 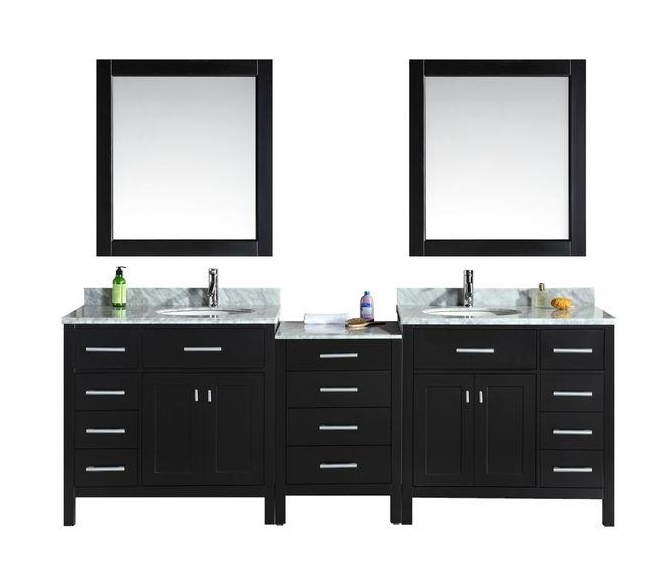 The Washington 36" espresso vanity set is stylishly constructed of solid plywood panels with veneer laminate. The stylish white rectangular sink and sleek espresso cabinetry bring style and utility to any bathroom. 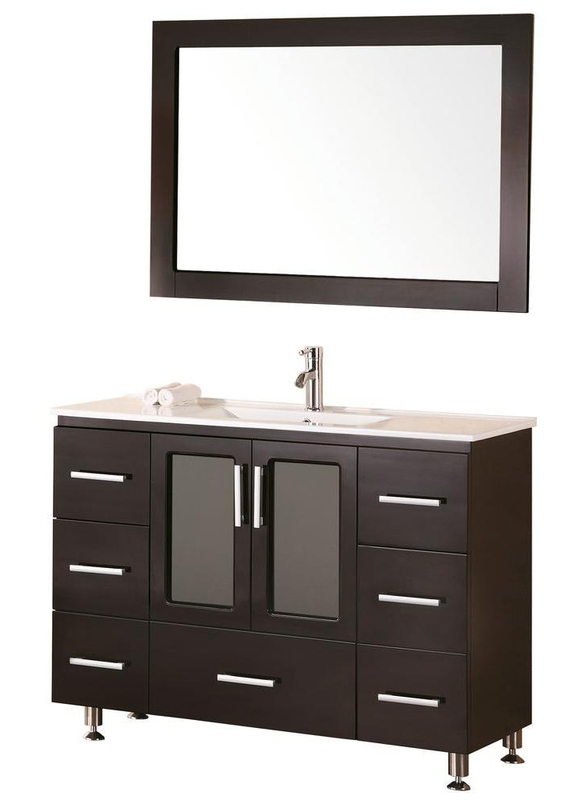 This vanity includes soft-closing cabinet doors and a large pullout drawer, all adorned with satin nickel hardware. The sides of the vanity feature a removable towel bar and shelving for additional storage and utility. Amatching mirror with shelf is included. Being limited in space doesn't mean having to give up quality or style. 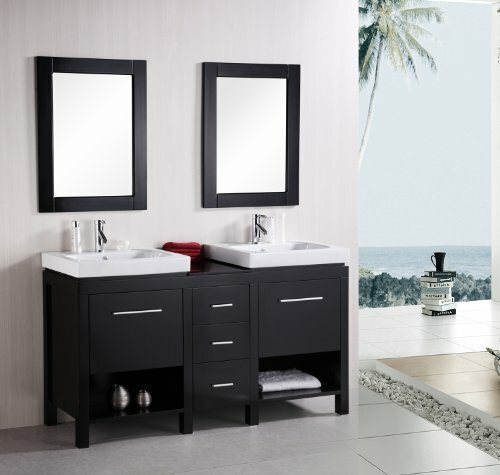 The New York 24" vanity set is a good example of maximizing utility in a small space. The large pull-down cabinet door features soft-close hinges, and the lower shelf is left open for additional storage. 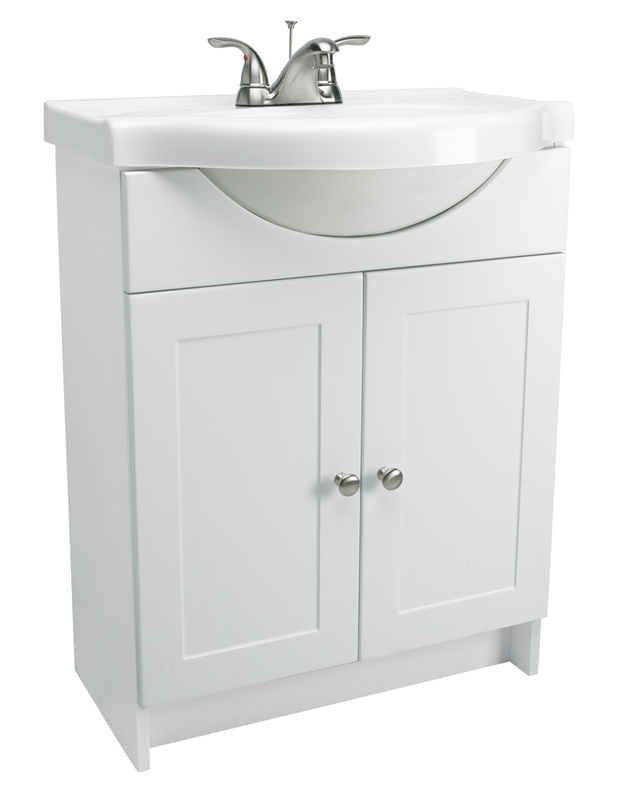 The drop-in sink with wide, flat edges creates reasonable space for essential toiletries. 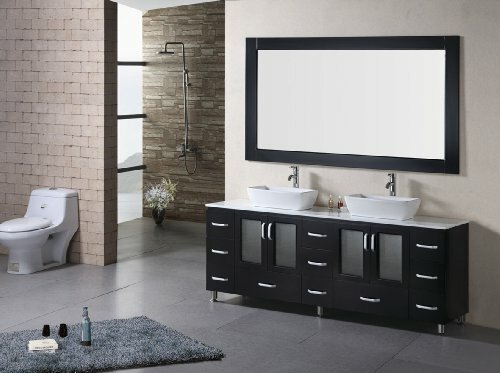 This vanity set includes the espresso cabinet of solid hardwood construction, porcelain sink with chrome pop-up drain, and a matching mirror. The London 30" Single Sink Vanity Set is constructed with solid wood and provides a contemporary design perfect for any bathroom remodel. 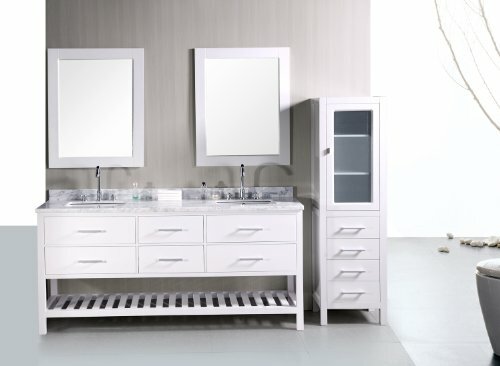 The storage in this free-standing vanity set includes a flip-down shelf and one double-door cabinet each accented with brushed nickel hardware. The cabinet is available in an espresso or white finish both as a complete set with a carrara white marble counter top and matching framed mirror. 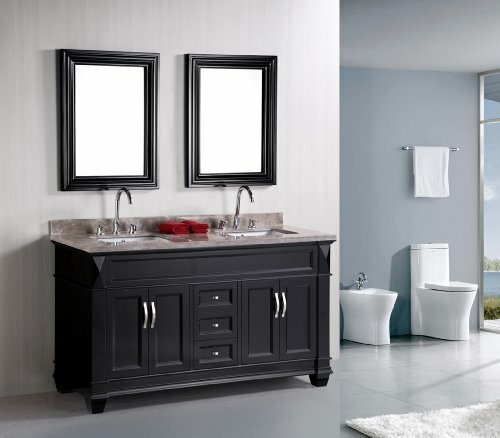 The London 36" Single Sink Vanity Cabinet Set is constructed with solid wood and provides a contemporary design perfect for any bathroom remodel. 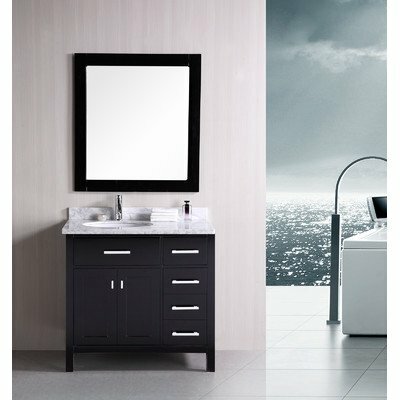 The ample storage in this free-standing vanity includes one flip-down shelf, four fully functional drawers and one double door cabinet each accented with brushed nickel hardware. The cabinet itself is available in an espresso or white finish and the set is complete with a carrara white marble counter top and matching framed mirror.